iPad is not cool. IT’s PUNK ROCK, HIP-HOP, BALAD-ISTIOUS way cool! First, I have to apologize. I have posted before this : I’ll wait until the iPad 3GS is on sale and stated I will not buy the 1st Gen iPad. Well, I am taking that back. I will buy the iPad, 1st Gen; the moment it reaches Malaysian shores. I’ve already set aside an iPad-Fund. Yesterday, I finally managed to have a full hands-on experience with the iPad and I was blown away. Especially by the capabilities of the iPad as a book reader. I was flipping through pages of Winnie the Pooh as if it was a real paper-based book. The whole process felt so right and so natural. As a multimedia tool, nothing surpasses the iPad. The speakers were clear and loud, and if that was not enough then you can plug in your own earphones. The iPad is a gorgeous movie player and akin to having your home tv sitting on your lap. Is it a writing tool? The built in Notes app can double up as an app to write your novels but since it can run iPhone apps, then WriteRoom would run fantastic on it. The possibility of writing a full novel on the iPad is there and I won’t be surprise if someone comes up with a port of a full fledge novel writing software for the iPad. So the iPad would sit in between my iPhone and my iBook. Most likely, the iPad would serve as my satellite device, which I take around and then sync to my iBook especially if I need to generate Word DOC reports and such. But I see the iPad totally taking over the role of my iBook in the near future. When will the iPad be available in Malaysia? It may come round to Malaysia by June but pricing is still un-known. I’m looking at a range from RM1,500 – Rm3,000. It all depends on whether the government will levy tax on it. If it is classified as a multimedia-device then tax will be levied but if it is considered a computer, there may not be tax. The iPad is truly an enigma. It’s not a computer neither is it a phone so it’ll sit in between my iPhone and iBook but when the apps gravitate towards the iPad platform, I am sure great things will happen. Slap on a video cam and it will make a great tool for video calls. Put in flash (if Apple ever wants this) then it’ll be a great platform for online games and Adobe AIR applications. The iPad is here to stay and it may have just defined a whole new genre of hardware. Would I buy the iPad, just days after it’s official launch? NOPE. I’ll wait until it hits, iPad 3GS; then I’ll fork out the cash to buy it, because by then the application would have matured and all the apps would run swell on it. And maybe there would be flash support and a web-cam thrown into the package. And once jailbroken, I can run OpenSSH with it and update my web-server via command line. Wouldn’t that be great? With all things Apple, they get better with the latest incarnation. So buying the first generation of any Apple product is for collectors. Yup, collectors of gadgets. The serious users will pile in by the 2nd or 3rd revision of the product. So hold on to your cash and wait until the geeks all agree that the iPad is really worth buying. Heck, the iPad 3GS may even be cheaper than the recently released iPad. At least these guys agree with me : Why You Shouldn’t Buy an iPad (Yet). Jailbreaking the iPad – it’s possible says hacker. When I finally am able to buy an iPad, then jailbreaking would be the first thing I do to it. For newbies, “jailbreaking” refers to act of unlocking the iPhone from it’s restrictions. Allowing the iPhone to run on various carriers and also to run unauthorized software – say themes and stuff. So jailbreaking is in fact a step forward in customizing your iPhone to run whatever you want. George Hotz, known as the guy who first unlock the iPhone, believes it can be done to the iPad. It’s plausible to believe that an iPhone OS jailbreak will also work for the iPad. While the iPad will support apps that are exclusive to the device, its OS shares the same DNA as the iPhone’s. I’m not sure when the iPad would reach Malaysia, but I reckon that if the jailbreak works with the iPad, we would see it here sooner than the official launch dates, as what happened with the 2G iPhone. 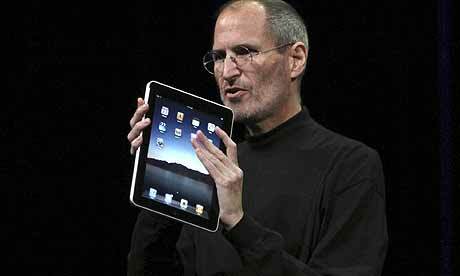 The iPad is slated for launch next week in America, so it would be no surprise to see it here late April or early May. What would I use the iPad for? Seriously, I can’t wait to get my hands on an iPad. Why? I’ve purchased iPods, iMac, iBook and iPhone; why not get myself an iPad. Add that to my list of all things Apple lying around on my desk. But that’s as far as it will go. Because seriously, what would you use the iPad for?